Featured image courtesy: Mahmoud Abou Zeid, better known as Shawkan. The recent Paris terror attacks have raised even more awareness about using digital media for human-to-human solidarity and show empathy around the globe. Many social media spontaneous initiatives and hashtags gained media imediate attention like #PrayforParis and #PrayforLebanon. Facebook activated its ‘safety check feature’ so that people in Paris can let friends know they’re safe with one click. The social media site has also launched the app to change users profile picture to French flag, urged by understandable emotion around the world and supporting the French nation in this moment of pain. Still, there are too many other countries suffering similar events or even worse! There is unfortunately a tendency in linking Middle East countries with terror: the reality is far different. Egypt is among the countries that are involved in the war against terrorism and already paying a high price on the political and economic levels. Egyptian blood count in this fight against terrorism, every day. But the international media ignore reporting this fact. A proactive team of 6, Egyptians and Italian lady, live in Hurghada, Red Sea and believe they can do something to support Egypt using the power of Social Media, so they decided to proudly act more than talk to keep the bright image of Egypt. On the top of the latest event of the Russian plane crash in Sinai, Inspired by Brandon and his “Humans of New York” this young active minds have first launched a page “humans of Hurghada” and “humans of Sharm” to raise awareness about the reality of the country, about the common stories of people, to tell the world that Egyptians are like anybody else as we all sharing the same planet. On 14th of November 2015, 19:35 exactly Support Egypt initiative started to create images for their friends on Facebook with Egypt’s Flag as a response to Facebook supporting France and not any other countries who are suffering from terrorism like Egypt, Lebanon and Syria. In 4 hours Support Egypt page has reached 3000+ organic fans with 286198 (number of impressions seen). Behind the idea: Ahmed El Araby, Ahmed Dorgham, Zizo Mohy, Yasser Dorgham, Barbara Castioni, Mariam Morgan, Ramy Mahmoud launched https://www.facebook.com/SupportEgyptOfficial/ . The 7 guys used Adobe Photoshop to create images to people with Egypt’s Flag and the Hashtag ‪#‎SupportEgypt‬ replying to messages on Facebook and created 7000+ profile image manually by Photoshop. In 12 hours, Support Egypt Facebook fan page hit 6000+ likes and thousands of messages from Egyptians around the world! Second day by 3:00 PM launched the website www.supportegypt.com to help people create their own profile pictures on the application and received more than 36,000+ page view (By Google Analytics) in one day. 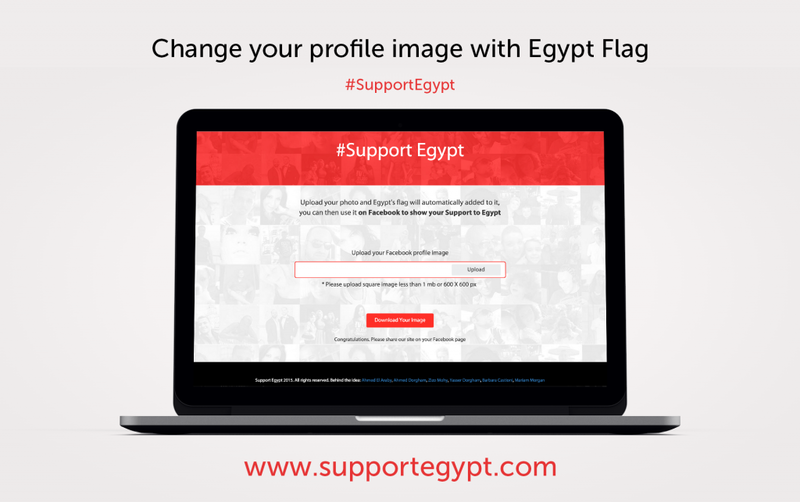 Until the website launch, they have been working all night to manually change thousands of profile pictures coming from all over the world and sending them back after changing users profile picture to Egypt flag. People want to support, people want to share, people want their voices heard. On the launch of Support Egypt Facebook fan page, users have been sending an average of 20 requests per minute. So far, Support Egypt witnessed over half a million people engaged on Facebook, and is still growing. Quoted from Support Egypt creators message to Think Marketing: We might not change the world, but for sure we can act to change people perception and support understanding of Middle East peaceful nature.